The REACH (Registration, Evaluation, Authorization and Restriction of Chemicals) chemicals regulation (EC No. 1907/2006) has regulated the registration, evaluation, authorization and restriction of chemicals in the European Union since 1 June 2007. REACH communicates comprehensive data. REACH makes new requirements for manufacturers, importers and users of chemical products: All substances on the European market must be registered and evaluated by the manufacturer or importer if produced or imported with an annual volume of one metric ton or more. The extent of the evaluation depends mainly on the amount produced or imported and the risks to be expected. The use of particularly hazardous substances may then be regulated by the authorities, through the means of mandatory authorisation (substances of Annex XIV) or a restriction (substances of Annex XVII). Accordingly, they are then subject to an official authorisation procedure or restrictions. REACH advances environmental and health protection in Europe. Newly-acquired knowledge about chemical substances, particularly with respect to their long-term effects, such as carcinogenic or reprotoxicological properties, and risk management constructed on this basis, should guarantee a higher level of protection of human health and the environment in the future. will have an impact that unfolds over the longer term. In the Defence sector, the companies Nitrochemie (manufacturer, importer, and formulator), Rheinmetall Waffe und Munitions GmbH (formulator and downstream user), Rheinmetall Landsysteme GmbH (downstream user) and Rheinmetall Defence Electronics GmbH (downstream user) are affected by the REACH regulation. An estimated 30,000 substances must be registered over a period of 11 years, by 2018. Substances which are produced in large volumes or which are already known to be particularly hazardous were recorded first. The first step toward REACH registration was the punctual pre-registration of phase-in substances with an annual production or import volume of one metric ton by 1 December 2008. This included mainly substances listed in the European Inventory of Existing Commercial Chemical Substances (EINECS). This inventory includes around 100,000 substance entries. All substances on the market when the obligation to determine the hazardous potential of chemical substances was introduced have been recorded in this inventory. The first phase of substance registration in accordance with REACH was successfully completed on 1 December 2010: The European Chemicals Agency (ECHA) confirmed receipt of several dossiers to Nitrochemie and issued registration numbers for all substances. Rheinmetall is entitled to produce, import, and then sell these substances without restrictions within the European Union. Prior to 1 June 2013, Nitrochemie had submitted several registration dossiers to the ECHA for substances with an annual volume of between 100 metric tons and 1,000 metric tons. The Agency then issued registration numbers. Since then, Nitrochemie has successfully registered five additional materials. Additional substance dossiers are being prepared by Nitrochemie for the third REACH phase, which will run until 2018. Until now, Rheinmetall Waffe Munition did not need to register any substances. The company ensures that the suppliers register all important substances required in defence production, thus supplying Rheinmetall in a REACH-compliant manner. The number of substances with restricted use or that are subject to authorization is rising sharply. At present, there are 31 substances subject to authorisation (listed in Annex XIV) and 168 substances are listed on the REACH Candidate list that may become subject to mandatory authorisation. In 2015, the first requirements for authorisation of Substances of Very High Concern came into force that also affect products made by Rheinmetall Defence. 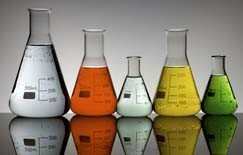 These substances are usually present in supplier components. Rheinmetall is reacting to this development with targeted obsolescence management, development and qualification of substitute substances in the products concerned, supporting applications of authorization sent to ECHA, and applications for exemptions in the interest of defence. The effort and expense involved in using substitutes can be very high, since changes require corresponding requalification of the products. In Article 33, REACH obligates all suppliers of articles to inform their clients if the supplied product contains more than 0.1 mass percent of a REACH candidate substance. In a judgment dated 10 September 2015, the European Court of Justice made clear that the calculation of the 0.1 percent concentration in this regard must be based on the weight of each constituent article (commonly referred to as a component), not the weight of the supplied global product. To implement this judgment, Rheinmetall is updating all its affected product data sheets and REACH information in order to properly inform its clients.